This gown is available in many fabric and trim options. Contact me for more information. 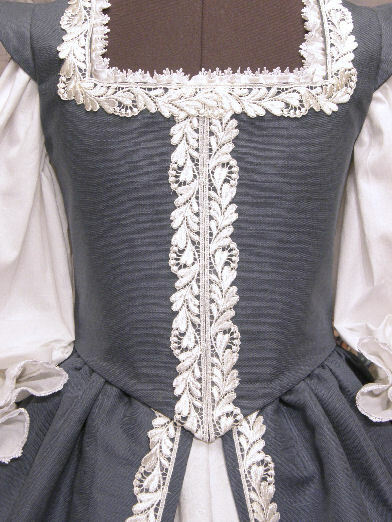 The bodice is designed to achieve the period-correct conical figure (no darts or princess seams) by pressing the chest and stomach flat and squeezing the bosom up above the neckline. 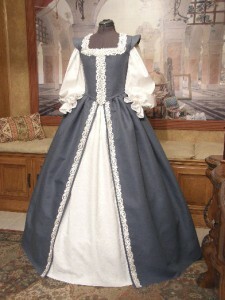 (Unfortunately, my dress form can’t “squish”, but hopefully you get the idea!). 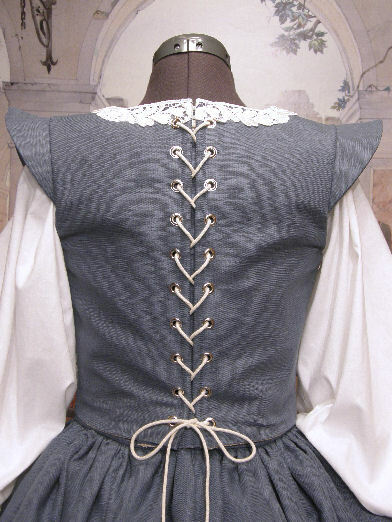 Cording laces up the back through 20 silver grommets. The cording ends are crimped with aiglets for ease of threading and a nice, finished look. It is lined with cream heavyweight upholstery fabric, interlined with heavy decor weight interfacing and contains 9 pieces of supportive boning (a combination of spring steel, spiral steel and poly). This bodice is sufficiently supportive and sturdy so no additional underpinnings (corset) are necessary. 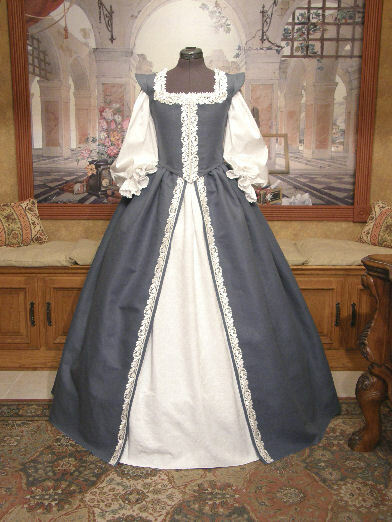 Your bust and waist measurements should be at least the same as the Bodice and can be 3 inches or more LARGER. The tighter it’s laced, the more “push up and together” effect you’ll get. 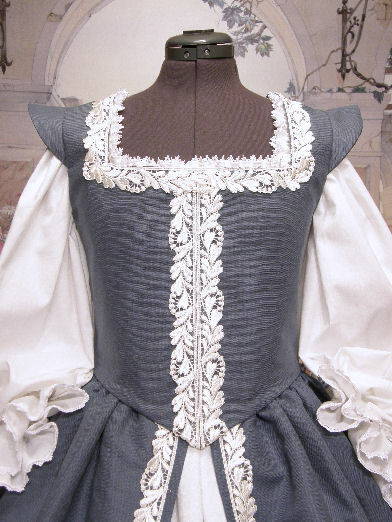 The neckline is designed for displaying a lovely decolletage. This very full panel skirt has been painstakingly gathered and attached to a matching waistband to eliminate bulk at the waist. 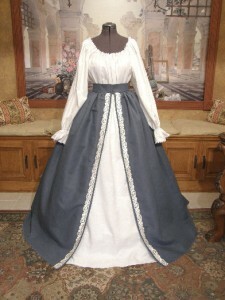 The bodice will cover the waistband and the gathered skirt will ‘pop’ just below. The openings of the split front have been embellished with the lovely venise lace. Serge hemmed to desired length, ready for professional hemming by your tailor. 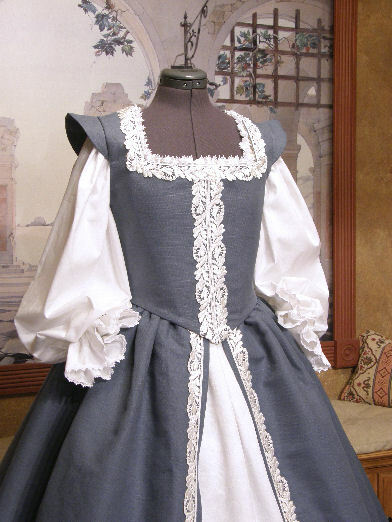 Is made with white muslin with a front panel of white cotton damask. The damask has a lovely, delicate woven design which is difficult to see in the photos. Drawstring waist with reinforced openings for the cording. Serge hemmed to desired length, ready for professional hemming by your tailor. 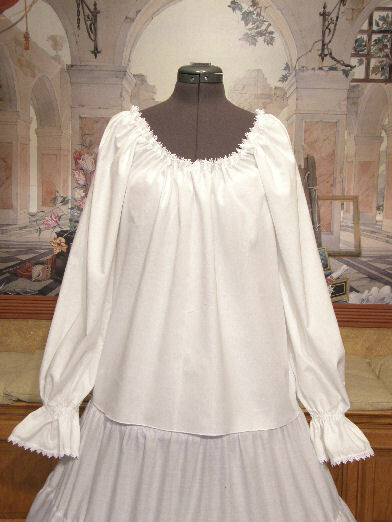 Is made with white cotton muslin, has extra full sleeves, and is trimmed with delicate venise lace at the neckline and cuffs. 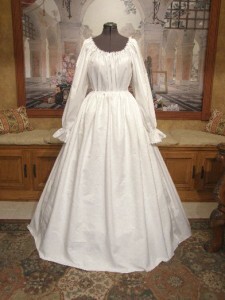 Neckline adjusts with drawstring ribbon. 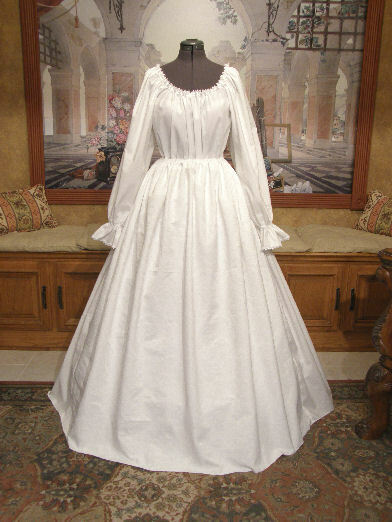 Is a rectangular piece which perfectly matches the bodice and is designed to lay under the cording. This allows the wearer to loosen the cording without showing the underlying chemise and allows for more size options. 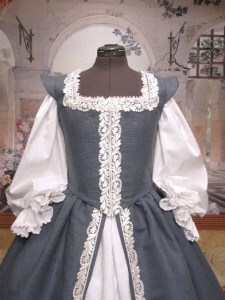 It is trimmed at the top with matching venise lace so when shown, the effect is a continuation of the bodice. The hoop slip is not included.